Weigh the dry ingredients into a bowl, then rub the butter in with your fingers until it reaches a sandy consistency. 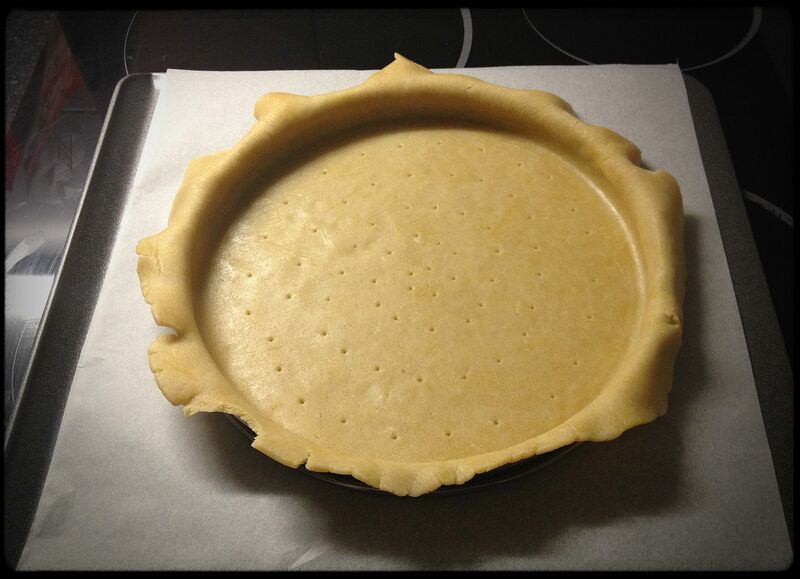 Add the egg yolk and water, and bring the pastry together with your hands into a ball. Flatten it into a fat disk and wrap it in clingfilm. 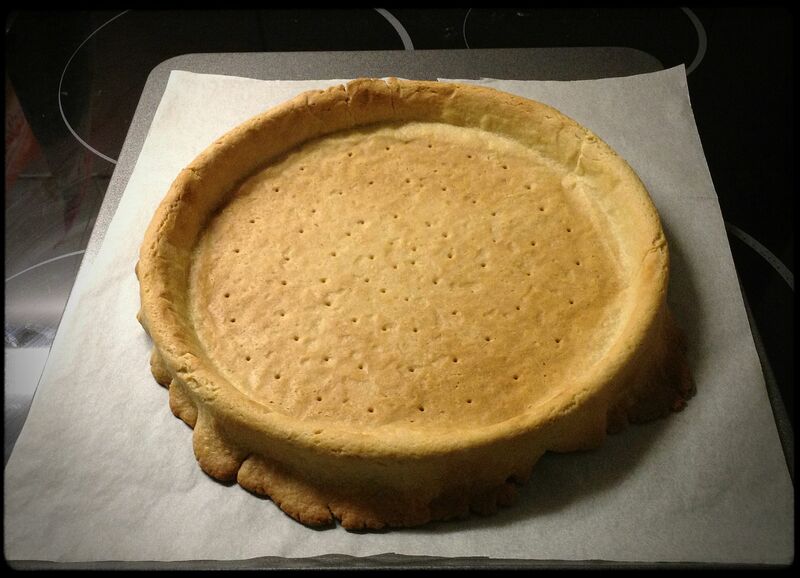 Refrigerate for at least 30 minutes and prepare your tart ring or loose-bottomed tart tin. 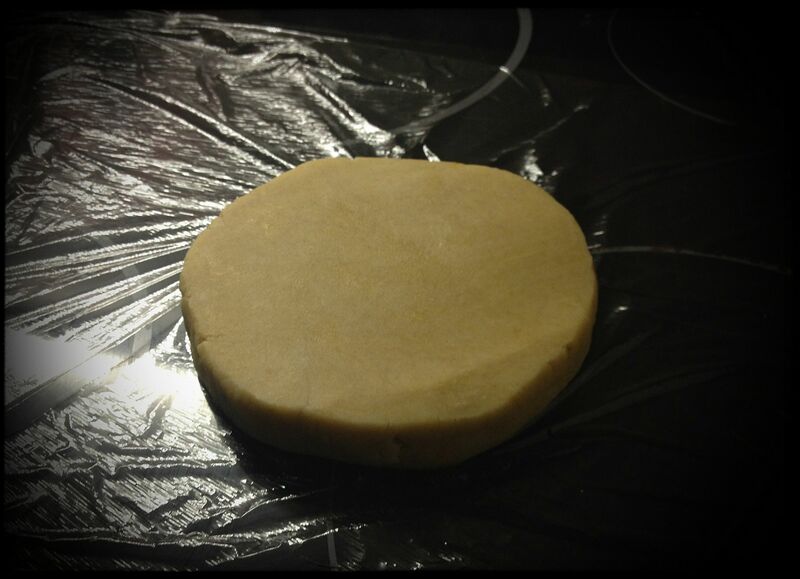 Most recipes advise you to roll pastry onto a floured surface, but I prefer rolling it onto a sheet of clingfilm. Sweet pastry is delicate and has a tendency to fall apart when manipulated, so the clingfilm enables you to move it to the tin without it splitting as it can when draped over a rolling pin. 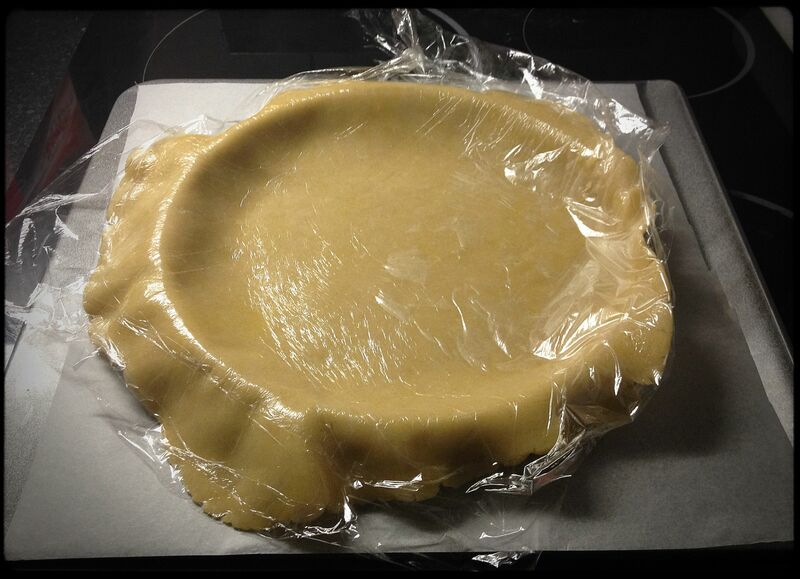 Grab the clingfilm with the pastry on it and tip it upside down over the tart ring. Leaving the clingfilm attached, carefully press in to the corners, against the ring. Peel away the clingfilm and discard. 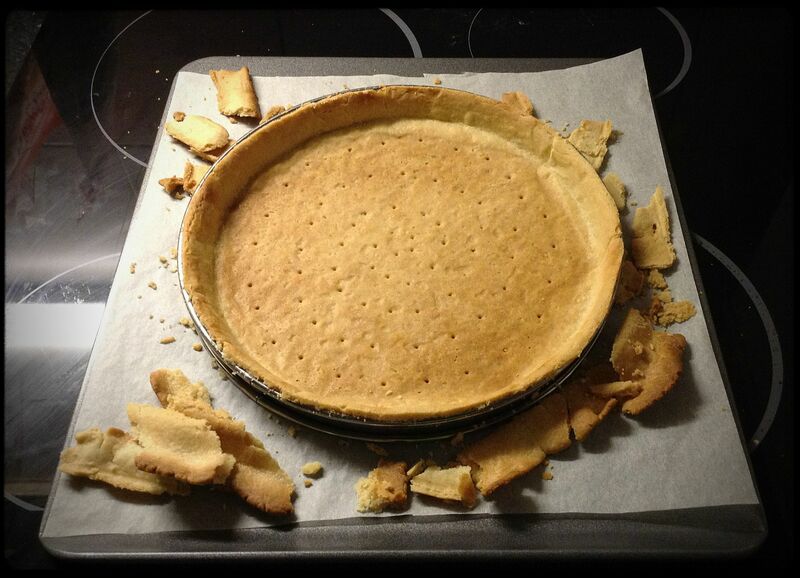 Leave the excess pastry draped over the sides so that the walls don’t drop during baking. Stab the base all over, then refrigerate again for 30 minutes. Meanwhile, centre a shelf and preheat the oven to 170C. Line the pastry case with baking paper and fill with baking beans, making sure they push right against the edges to reduce the risk of the pastry shrinking away from the sides. Bake for 20 minutes. Slowly remove the paper containing the baking beans, then loosely cover the pastry walls with a thin strip of foil to shield them from browning too much. Return to the oven for 5-10 minutes, until it’s a nice golden colour. Remove from the oven, trim the edges and leave to cool. N.B. I don’t have photographs of these stages because caramel can transform from all-going-well to absolutely-ruined-start-again in seconds, so I didn’t want to risk ruin by standing around with a camera at crucial moments. Remove the seeds from the vanilla pod and drop the seeds and the pod into a small saucepan with the cream. Bring to a rapid boil, take off the heat then leave on the side to cool a little. Preheat the base of a second saucepan on a low heat. Cover the bottom of the pan with a layer of sugar. When it begins to melt around the edges, gradually add a little more sugar, concentrating on covering the melting sections first. Continue gradually adding more. When you want to bring unmelted crystals into the melted sugar, be sure only to stir in tiny circles, never allowing any air to fold in. Watch for: an amber colour, a fine mist starting to come off the pan, and tiny bubbles in the middle of the pan increasing in speed. Take the caramel off the heat. Add a tiny bit of the cream/vanilla (don’t remove the vanilla pod yet), stirring simultaneously. It will bubble up a lot, so keep your face and hands clear of the steam. Continue adding cream until it’s all in and smooth. Once all the cream is in and the caramel has cooled a little, add the butter a few chunks at a time and stir in. Don’t worry if it looks split at any point; it will emulsify eventually. Pour caramel into a heat-proof dish (still including the vanilla pod) and leave to cool. Place the chopped chocolate in a bowl large enough to hold all the ingredients. Bring the cream to the boil. While the cream is heating, work the butter until it is very soft and creamy and leave to one side. When the cream is at a full boil, remove from the heat and – working with a rubber spatula – gradually stir the cream into the chocolate. Work SLOWLY, starting in the middle in tiny circles, and gradually widening out to the edges. 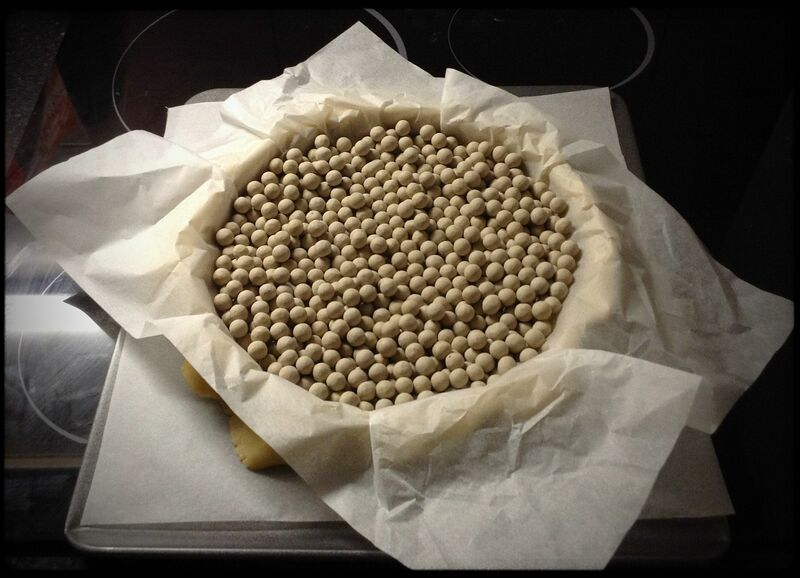 Continue this pattern, without creating bubbles, until the chocolate is completely melted and the mixture is smooth. Leave the bowl to cool for a few minutes before adding the butter in two batches, stirring in the same pattern as before. Making chocolate ganache can be really tricky as it’s sensitive to things like room temperature, the speed of stirring and all sorts. If it splits (you’ll see fats separating out of the chocolate and the texture will be odd), don’t panic; you can probably still rescue it. Leave it in its bowl and pop it in the fridge for about 15-20 minutes. The fats will have settled and partially solidified on the surface so it’ll look awful. Take your clean rubber spatula and give it a good stir. It should come together. You may find a few tiny spots of butter, which are easily plucked out and discarded. Don’t refrigerate it again as you’ll need it at a spreadable consistency. Very simple, really. 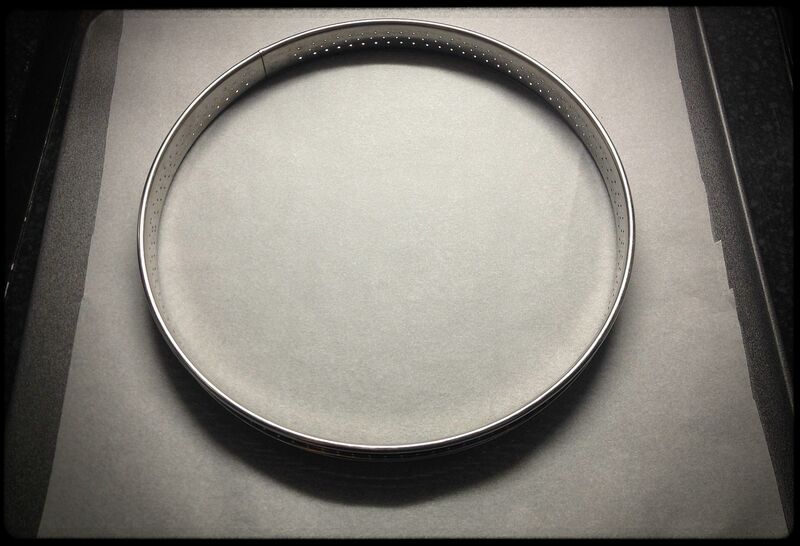 Depending on the equipment you’ve used, make a decision about whether it would be better to leave the pastry case in the tin/ring so that the walls have support or to remove it now before it has been filled. 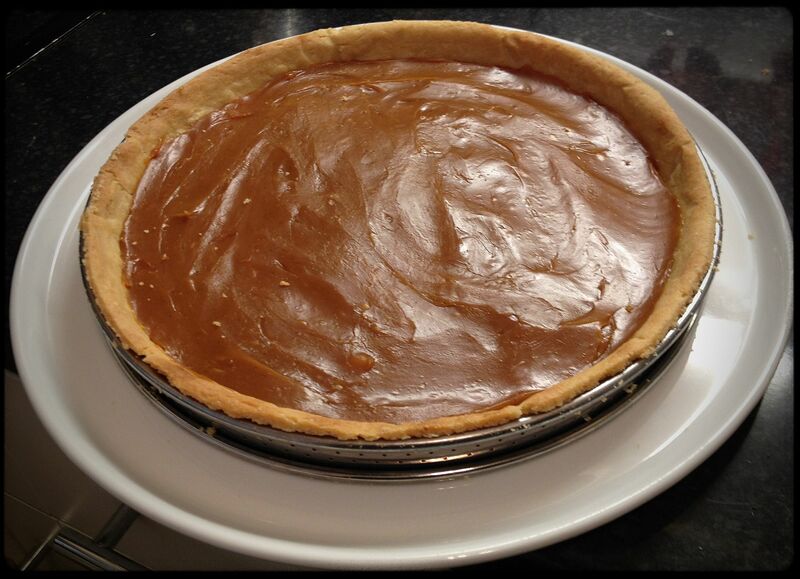 Pour the caramel into the pastry case and distribute evenly, all the way to the edges. 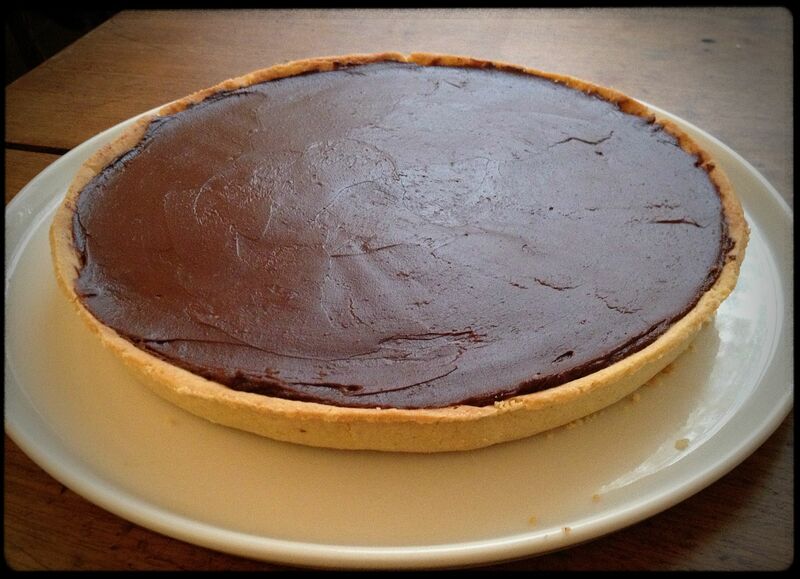 Gently spread the ganache over the top, being careful not to push down and displace the caramel. 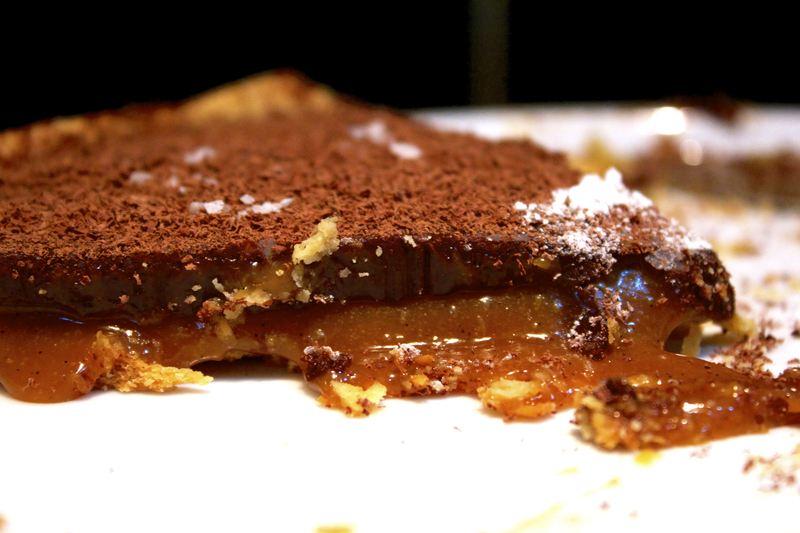 If you like, you can finish with a dusting of icing sugar or grating chocolate over the top. Cover with an upturned bowl or a cake box lid and leave at room temperature to set into a sumptuous texture. 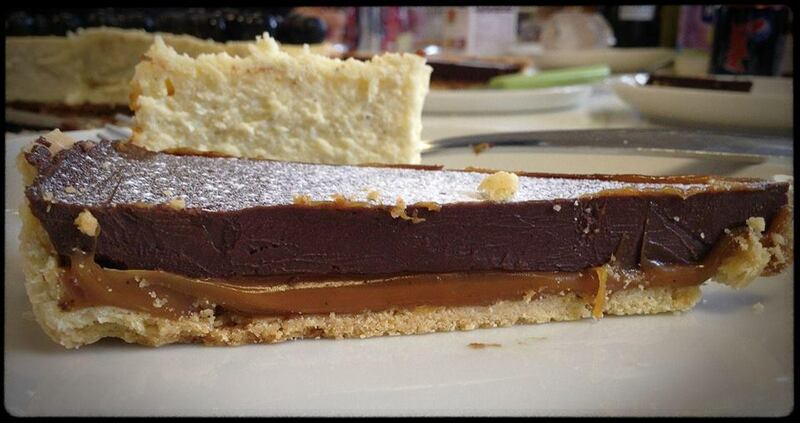 This entry was posted in Cooking & Baking and tagged chocolate ganache, sea salted caramel, sea salted caramel tart, sweet pastry by wordspicturesandcake. Bookmark the permalink. Whoever invented sea salt & caramel must be some kind of genius, is there any better combination, seriously??!! Apparently it’s a French tradition that goes back centuries. The French get food SO right…!